Reading and share top 9 famous quotes and sayings about Summer Rains by famous authors and people. 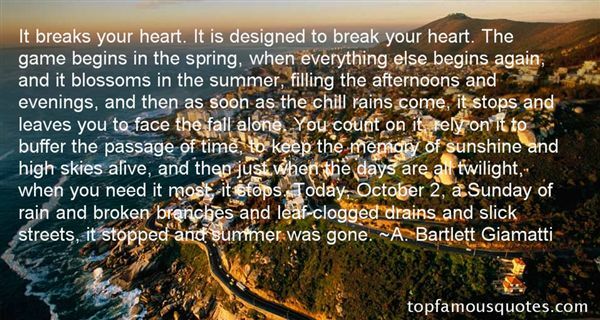 Browse top 9 famous quotes and sayings about Summer Rains by most favorite authors. 3. 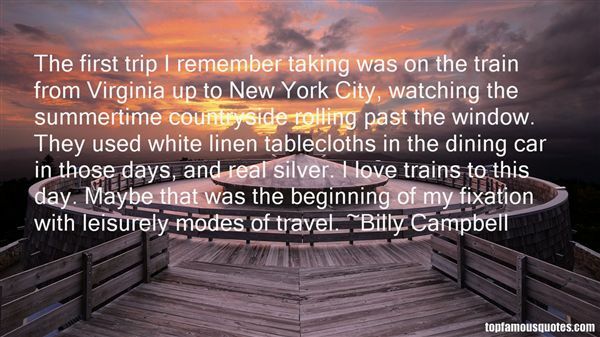 "The first trip I remember taking was on the train from Virginia up to New York City, watching the summertime countryside rolling past the window. They used white linen tablecloths in the dining car in those days, and real silver. I love trains to this day. Maybe that was the beginning of my fixation with leisurely modes of travel." 4. "Last summer, when he thought I wasn't looking, I observed Cubby telling one of the neighborhood six-year-olds that there were dragons living in the storm drains, under our street. 'We feed them meat...and then they don't get hungry and blow fire and roast us. 'Little James listened closely, with a very serious expression on his face. Then he ran home to get some hot dogs from his mother." 5. "Do your job well without expecting any appreciation; then you will see that all the appreciation will come onto you just like the summer rains coming onto the thirsty flowers! Just do your job well!" 6. "Before Summer RainSuddenly, from all the green around you,something-you don't know what-has disappeared;you feel it creeping closer to the window,in total silence. From the nearby woodyou hear the urgent whistling of a plover,reminding you of someone's Saint Jerome:so much solitude and passion comefrom that one voice, whose fierce request the downpourwill grant. The walls, with their ancient portraits, glideaway from us, cautiously, as thoughthey weren't supposed to hear what we are saying.And reflected on the faded tapestries now;the chill, uncertain sunlight of those longchildhood hours when you were so afraid"
7. "I will love you like the desert burns along the sun when they are together,and when you will be gone,just like every one else,I will cry for you like the snow that melts at the first hint of summer...and hoping that you'll be backI will miss you like the clouds lose themselves when it rains..."
8. "If I were you, Mr Lascelles," said Childermass, softly, "I would speak more guardedly. You are in the north now. In John Uskglass's own country. Our towns and cities and abbeys were built by him. Our laws were made by him. He is in our minds and hearts andspeech. Were it summer you would see a carpet of tiny flowers beneath every hedgerow, of a bluish-white colour. We call them John's Farthings. When the weather is contrary and we have warm weather in winter or it rains in summer the country people say that JohnUskglass is in love again and neglects his business. And when we are sure of something we say it is as safe as a pebble in John Uskglass's pocket." 9. "The new country lay open before me: there were no fences in those days, and I could choose my own way over the grass uplands, trusting the pony to get me home again. Sometimes I followed the sunflower-bordered roads. Fuchs told me that the sunflowers were introduced into that country by the Mormons; that at the time of the persecution when they left Missouri and struck out into the wilderness to find a place where they could worship God in their own way, the members of the first exploring party, crossing the plains to Utah, scattered sunflower seeds as they went. The next summer, when the long trains of wagons came through with all the women and children, they had a sunflower trail to follow. I believe that botanists do not confirm Jake's story but, insist that the sunflower was native to those plains. Nevertheless, that legend has stuck in my mind, and sunflower-bordered roads always seem to me the roads to freedom." Eu me lembro, eu me lembro. Acordei de manhã e foi tudo um sonho maravilhoso. Mamãe riu, dizendo que viagem no tempo parecia ser uma coisa divertida e que queria tentar também.Essa foi a primeira vez."